“I will be your voice” is a wildlife conservation campaign based in Cape Town, raising support and awareness for animals and people in need of a voice. To mark World Environment Day and In aid of the Chipembere Rhino Foundation, a prestigious Gala evening is being held on Saturday, 8 June at the Mount Nelson Hotel. Freshlyground will be entertaining the guests while well known TV vet and ‘Animal Planet’ personality, Dr. William Fowlds is the guest speaker. Dieter Voigt of Pasella is MC for what will be an entertaining and informative event including a three course dinner, art auction and concert in support of a very worthy and genuine cause. 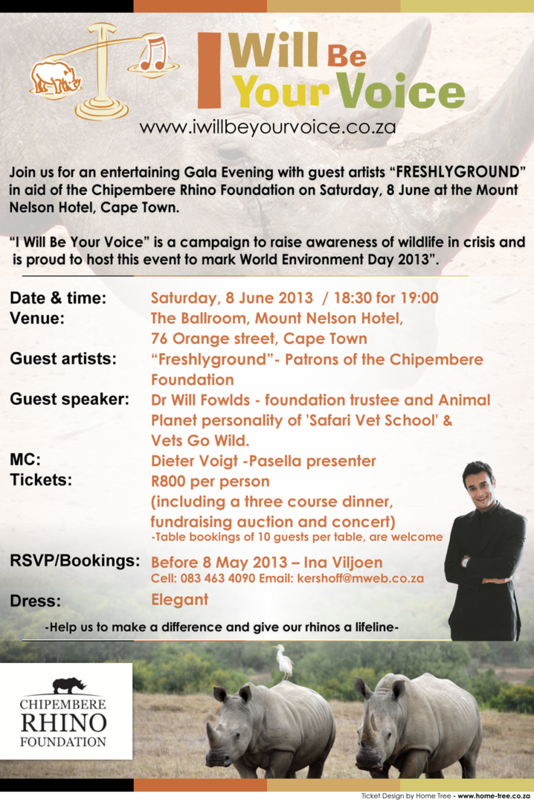 Companies and individuals in Cape Town are encouraged to take action and join the event by booking tables and tickets. Opportunities exist for companies to display their logos and advertise their involvement at the event. For bookings please contact Ina Viljoen on: 0834634090 or visit the website: www.iwillbeyourvoice.co.za for more information. We at AV Direct are asking our clients to support in this worthy cause by booking a table for the evening and sharing in this wonderful campaign.